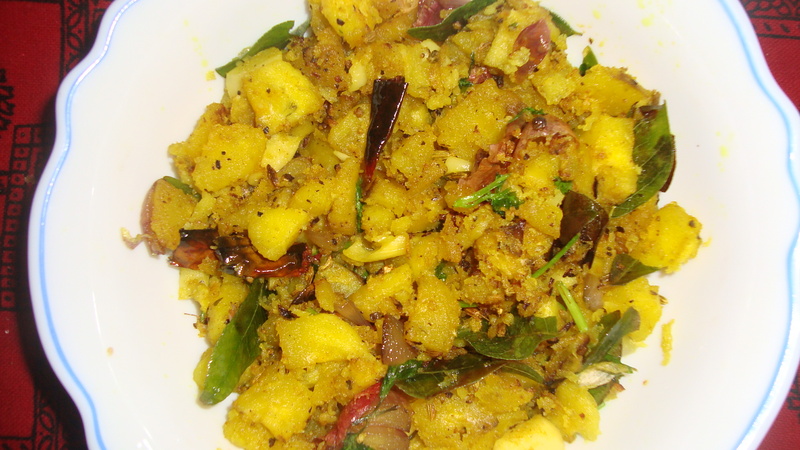 Ash plantain (Saambal Vaalai, as it is called in Tamil) is often used in Sri Lankan and South Indian cuisine. 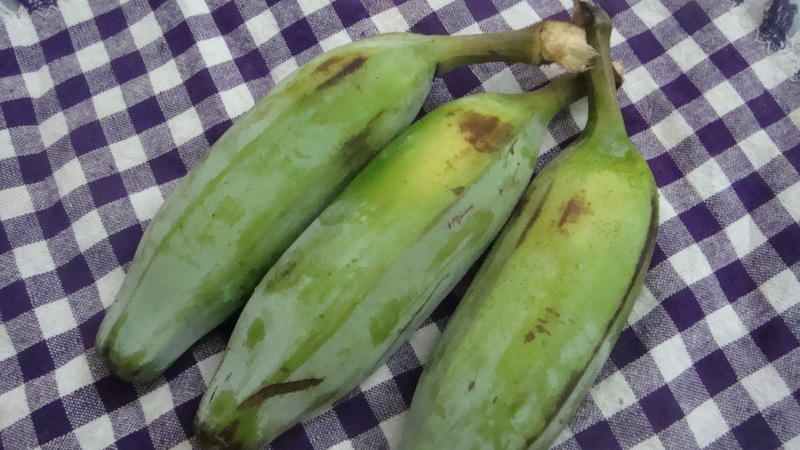 I am not very familiar with the varieties of plantains but as far as I am aware, ash plantain is the more common and popular variety in Sri Lanka and is a cooking plantain. 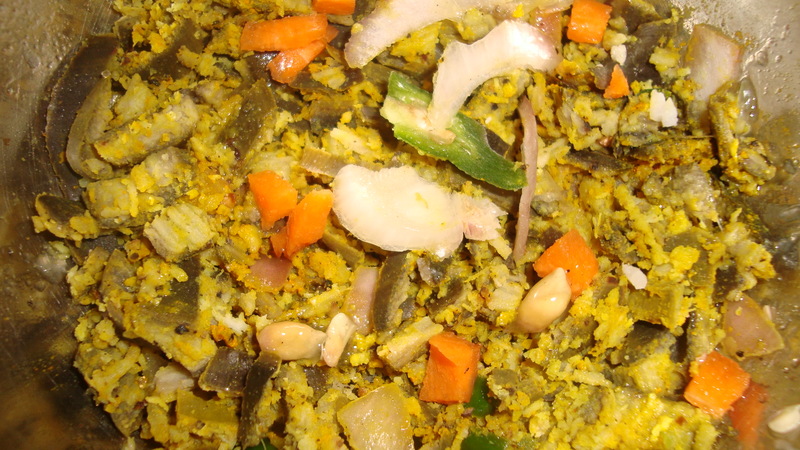 Today’s recipe is that of an ash plantain curry that my mother quite often makes at home. Peel the ash plantains and slice them. Lightly fry the ash plantain slices in a little oil. Keep aside. 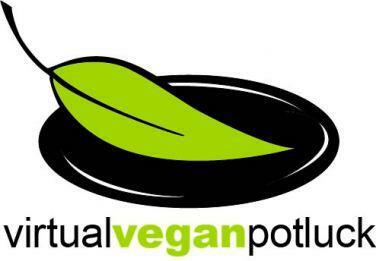 In a pan, add 1 tbsp oil and sauté the fenugreek seeds, chopped onion and curry leaves for a minute. Add the lightly fried ash plantain slices to the pan. Mix well and continue stir-frying for another 2 – 3 mins. Then, add the tamarind extract to the pan, followed by the thin coconut milk and the curry powder. Season the curry with salt to taste. Mix well and cook the curry for about 10 mins till the gravy thickens. Just before removing the pan from stove, add a tsp of sugar and mix well. Serve the spicy ash plantain curry with rice. 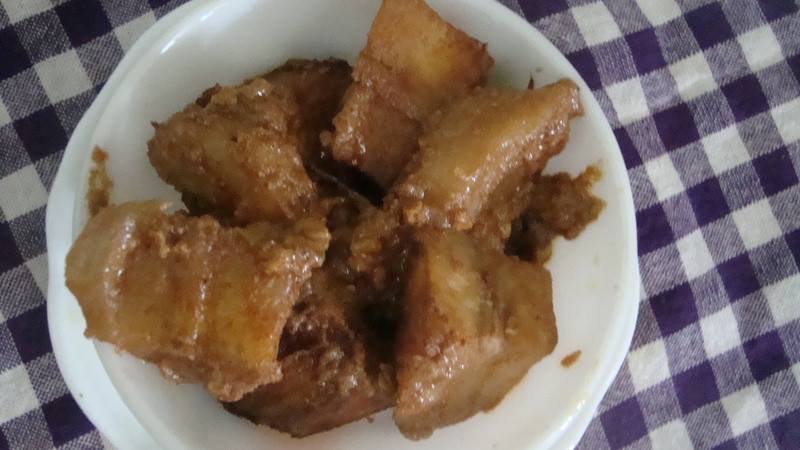 Today’s recipe is a slightly different version of vaalakkai varuval. I like ash plantains so I enjoy the different ways it is cooked, however slight the difference might be. Boil ash plantain with skin. 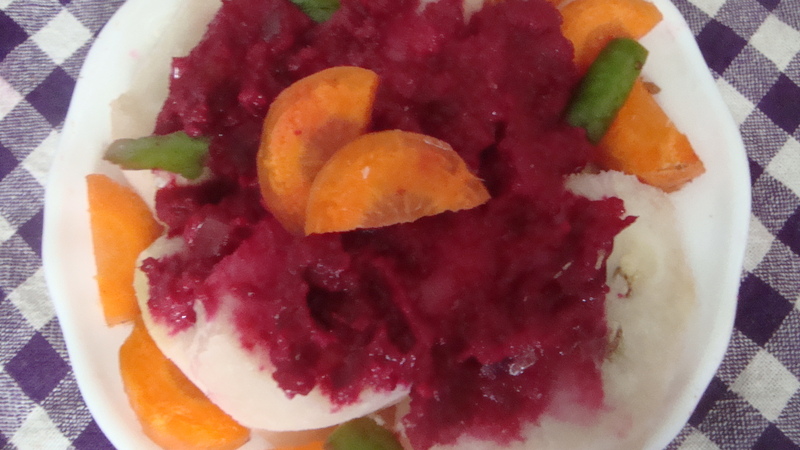 Remove peel and chop the boiled unripe fruit up. Add some salt and turmeric powder to the ash plantain pieces and keep aside. Heat 1 tbsp oil in a pan and fry the fennel, chopped dried red chillies, shallots and garlic for a few mins, until the aroma of the fried onions and garlic comes out. 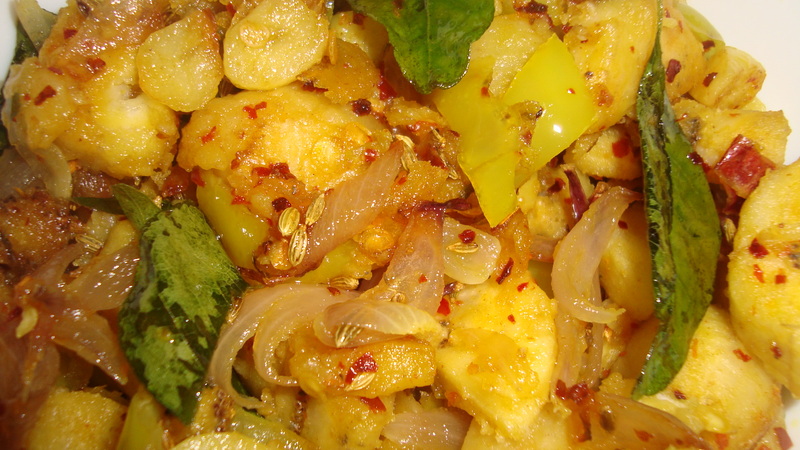 Add the marinated, chopped pieces of ash plantain and curry leaves and cook for about 10 mins, until sufficiently cooked. Garnish with chopped coriander or curry leaves. Back home after an amazing two weeks of travelling around Yunnan province, it was comforting to be greeted by the familiar. 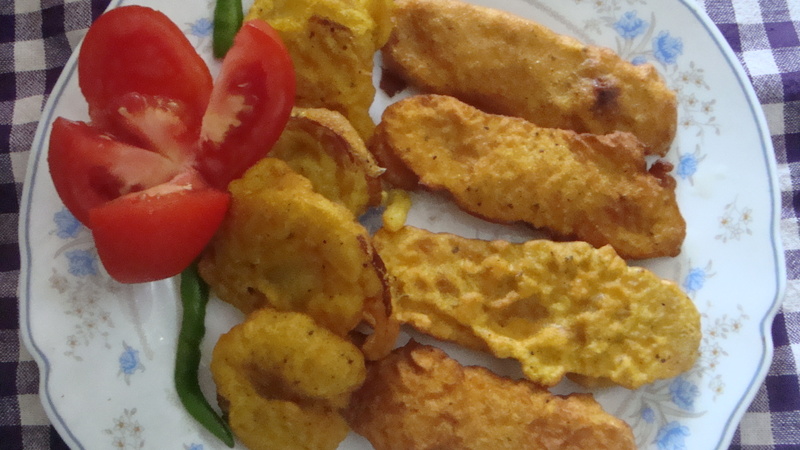 So, my first post for this month will be to share my mother’s recipe for her regular fried ash plantain which I really enjoy. Boil the ash plantain with skin for 15 minutes. Set aside the ash plantain to cool. 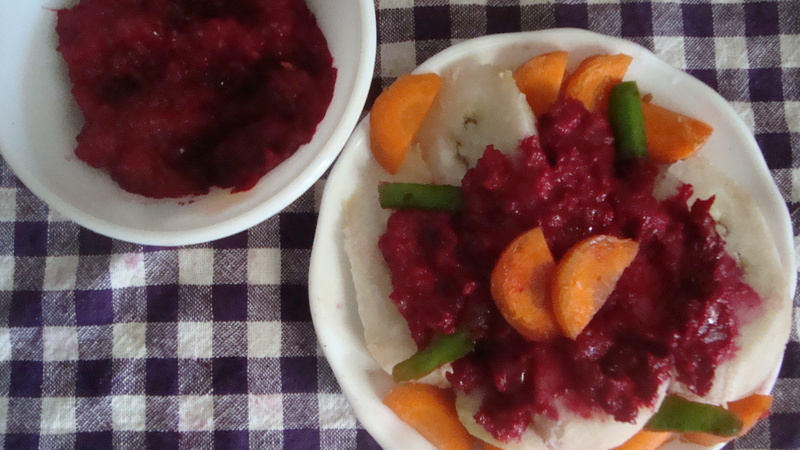 After it has sufficiently cooled, remove skin and chop the boiled fruit into small pieces. Chop up the malu miris, onion and garlic. Mix the chopped ash plantain, malu miris and ½ tsp turmeric and ½ tsp salt and let the flavours soak in. Heat 2 tbsp oil of sesame oil in a pan and add the fennel seeds and the chopped onion and garlic. When the aroma of the onion and garlic wafts about, add the turmeric and salt coated chopped ash plantain and malu miris and the curry leaves. Cook until they are sufficiently fried which will take around 10 mins. Just before removing the pan, add 1 tsp crushed chillies and mix well for a minute.